Last week, we released the results of a national poll of voters who said they supported President Donald Trump in the 2016 election, as well as focus groups of mostly Trump voters (but also some voters who either supported Hillary Clinton or voted third party last year). We found that nearly all the Trump voters we surveyed at least somewhat approved of the president. After focusing on the poll last week, some readers asked us for more information about the focus groups. So this week we’re releasing transcripts of the eight focus groups we conducted from April 4-18. We worked with Public Opinion Strategies, a well-respected Republican polling firm, to conduct both the poll and focus groups. These focus groups were held in five different locations: Pittsburgh, Columbus, Oak Creek (Greater Milwaukee), Canton (Greater Detroit), and Houston. We chose these locations because they were in states that voted for Barack Obama in 2012 and then shifted to Trump in 2016 or, in the case of Houston, was in a state that shifted markedly toward Clinton in 2016 but Trump still carried comfortably. The focus groups generally were composed of 10 people, with a roughly even mix of men and women, and anonymity was given to the participants to give them latitude to speak freely. The transcripts only note whether the person speaking was a man or a woman. Glen Bolger of Public Opinion Strategies moderated all of the focus groups. — Proud Trump supporters: Voters who said they had voted for Trump and that they strongly approved of his performance. — Romney-Trump voters: Participants who said that they voted for both Mitt Romney in 2012 and Trump in 2016. These are generally reliable rank-and-file Republican voters, although they were not all necessarily strong Trump supporters. 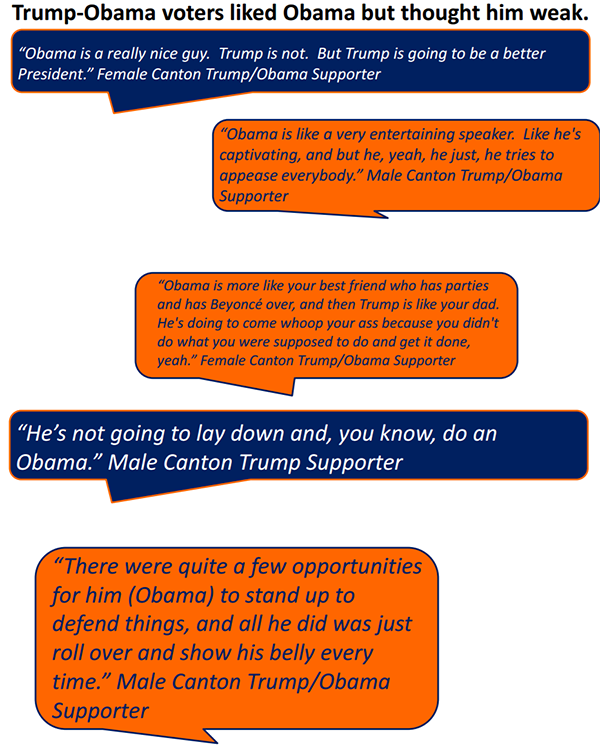 — Obama-Trump voters: These participants said they had voted for Barack Obama in 2012 before backing Trump in 2016. — Soft Republican/independent Clinton voters: These were voters who identified as Republican-leaning or independent but who said they voted for Hillary Clinton. — Third party or non-voters: These participants said they voted third party or didn’t vote for president in 2016. 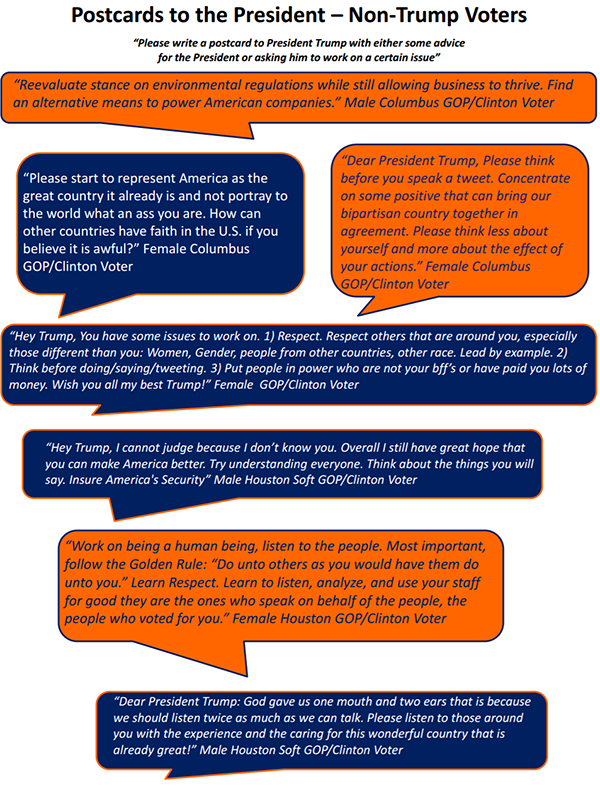 What follows are some brief observations and anecdotes from these five types of voters we interviewed, as well as links to the full transcripts from each of the eight total focus groups. 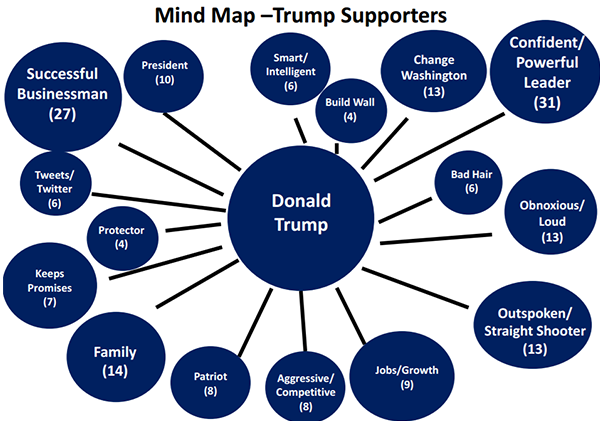 According to our poll of Trump voters, 42% said they strongly approved of Trump, so these participants represent an in-depth look at the most intense Trump supporters. 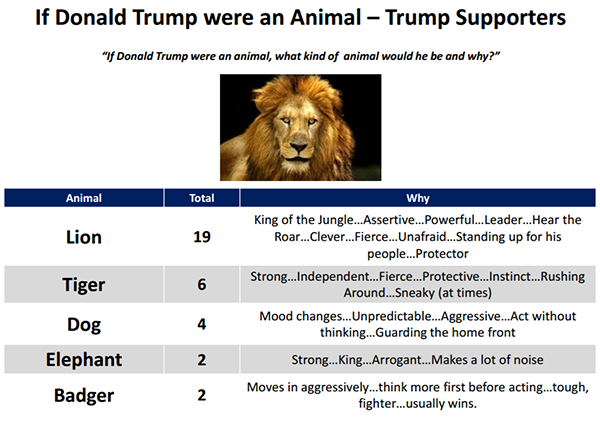 One of the open-ended questions that we asked all focus group participants was if Trump were an animal, what kind of animal would he be, and why? Participants were asked to write down their answer before sharing it with the group. This was a group of Trump voters who were not quite as uniformly supportive of the president as the “Proud Trump” groups. Less than half of the focus group participants said they had voted for Trump in the primary (several reported voting for home-state Republican Gov. John Kasich instead). Many were animated by a strong dislike of Hillary Clinton rather than overwhelming support of Donald Trump (in our poll, we found that 43% of Trump voters said their vote was more against Clinton than for Trump). About halfway through this focus group, news broke that President Trump had ordered a military strike on Syria. We decided to break the news to them and ask for their immediate reactions as the final question of the night. The strike split the room. For instance, one woman was supportive; “All that needs to happen for evil to survive and succeed is for good people and good countries to sit back and do nothing, and that’s why the United States has to be the one to do it.” Others were leery of any intervention in the Middle East: “We need to pack our bags and go home from the Middle East,” one man said. The whole exchange is available near the end of the transcript. Our poll of Trump voters found that one in five respondents reported voting for Obama at least once. Granted, voters are not always accurate in their reporting of past votes, but there is a fair amount of evidence that several million Americans switched from Obama in 2012 to Trump in 2016. These voters were likely the difference in states like Michigan and Wisconsin, which Trump carried by less than a percentage point apiece after Obama had won each convincingly twice. It’s hard to think of two politicians more different in their personal styles than the reserved and aspirational Obama versus the bombastic and gritty Trump. We asked the Obama-Trump voters to compare the two, and many of the responses suggested that these voters, fairly or unfairly, saw Trump as being tougher than Obama. While Obama-Trump voters arguably decided the election, Trump still lost some typically Republican voters, particularly in well-educated and affluent areas in the Sun Belt. As noted above, Trump significantly underperformed Mitt Romney in Harris County, which contains Houston: Trump lost it by 12 points after Romney came within a tenth of a percentage point of winning it. There was a similar dynamic in Ohio’s Franklin County (Columbus), which Trump lost by 26 points after Romney lost it by 23. About 6% of all voters cast ballots for non-major party candidates in 2016. That’s the highest share of non-major party voters since 1996, when about 10% of voters picked someone other than the Democrat or the Republican (Reform Party candidate Ross Perot, competing in his second election, got 8.4% of the vote, more than 10 points fewer than his more successful 1992 campaign). The combined total of non-major party votes in 2016, a little more than 8 million, was actually a slightly bigger total number of votes than Perot won in 1996 (albeit in a larger electorate). Our final group included some of these voters, as well as some participants who did not vote at all in 2016. I mean, I think all politicians, if you make it to the level where you’re running for any sort of state office, you’re generally, probably going to be a pretty bad person. You know, so you’ve got Hillary Clinton who’s a rat. You’ve got Trump, who’s a bigger rat… And you’ve got Gary Johnson who’s a smaller rat with way less education than both of these guys. And then you’ve got Jill Stein who takes all her money from her parents, so you have options who are just pointless. I mean, federal elections don’t really affect anything, and the Electoral College kind of runs the entire show anyway, so mainstream politics are kind of pointless. Also, living in Texas, odds are it’s going to end up being Republican, so even if I did vote for Hillary, the Electoral College . . . I wouldn’t vote for Hillary, but with the way that it’s set up, the popular vote doesn’t really matter. It’s the Electoral College vote, so me voting for any other party besides Republican is not going to make a difference. According to Michael McDonald’s United States Elections Project, about 137 million people cast votes for president last year, but about 231 million were eligible to vote. That means more than 90 million people could have voted last year but chose not to. As a reminder, the full report summarizing the poll and focus groups is available at: http://www.centerforpolitics.org/crystalball/wp-content/uploads/2017/04/Trump_voter_poll_summary.pdf. The full poll results are available at: http://www.centerforpolitics.org/crystalball/wp-content/uploads/2017/04/Trump_voter_poll.pdf and the crosstabs are available at: http://www.centerforpolitics.org/crystalball/wp-content/uploads/2017/04/Trump_voter_poll_crosstabs.pdf. The Crystal Ball team would like to thank Glen Bolger and Public Opinion Strategies for conducting this study for us and to the many who shared and wrote about the poll and focus groups since the results have been released.